Gray & Becker Construction started business in 1947 by Joe F Gray and Fritz H Becker Jr, who started out as general contractors having the notoriety of being the first contractor in Austin, Texas to build a building with Central Air Conditioning. 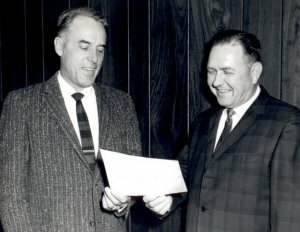 Joe F. Gray and Fritz H. BeckerThe company quickly moved to commercial construction and development and as a StranSteel Builder, Gray & Becker Construction Co. was awarded the Building Of-The-Year Award in 1966 for the Texaco Truck Stop. In the 1970's Gray & Becker Construction Co. shifted focus solely on the Furnishing and Erection of Pre-Engineered Metal Buildings. Gray & Becker Construction Co. has been an Authorized Varco-Pruden dealer since 1980 and is currently a member of the Presidential Advisory Council and has won numerous awards for quality buildings in a wide range of categories. Gray & Becker Construction Co. is committed to quality Pre-Engineered Metal Buildings that are environmentally friendly, cost effective and designed to meet your specific needs.